The research centre's new curved building blends in near seamlessly with the forest on the adjoining hill. This is thanks to the slatted sun blinds on the building's eye-catching exterior, which reflect the deciduous forest leaves' changing colours throughout the seasons – making each of its different sections stand out from the rest during different parts of the year. The new building of the German Centre for Neurodegenerative Diseases (DZNE) on Venus Hill in Bonn on the grounds of Bonn University Hospital, the construction work of which started in May 2013, is extremely striking and, with a usable area of 16 thousand square metres, is one of the largest research centres in North Rhine-Westphalia. The centre conducts research into neurodegenerative diseases such as, e.g. Alzheimer's and Parkinson's disease, and develops associated preventative, treatment and care strategies. Bonn's University hospitals have an excellent reputation as research, teaching and medical care institutes – and that is worldwide. The creation of the new centre, which comprises three connected buildings, has further underlined Bonn's significance as an international research location. One of the most important pre-requisites for effective research and teaching is an environment that is conducive to these activities, which is why the new building is extremely bright, light-flooded and features large windows. A building such as this also requires highly durable flooring, which - in this case - was installed by the specialists from Parkett & Dielen Hapke GmbH from Ahlen. May 2016. A warm and slightly rainy spring morning. The entrance area of the future DZNE is stacked high with building materials. This includes pallets with sacks of STAUF RM and SPP 95 filling compound, as well as cans of STAUF D 54 primer. This is in addition to packs of BauBuche, natural wooden flooring made of laminated veneer lumber manufactured by Pollmeier, ready and waiting for installation. This elegant wood flooring is produced from whole tree trunks and is comprised of 3mm-thick parallel- or cross-laminated wood panels. Despite its elegance, it is extremely though as well as very easy to care for, making it perfect for use in the new research centre, which is visited by several hundred people a day. In the end, Pollmeier supplied a total of 800 square metres of BauBuche, which was fitted in the foyer, one of the lecture halls, the cafeteria and eight trial participants rooms in the new building in Ahlen. One of the bigger challenges faced by the wooden floor installers was the tiered seating in the research centre's lecture hall. "Installing wooden flooring on level ground is easy. But fitting it on this kind of a surface takes great skill and experience", explained master installer Werner Hapke. The first phase of this installation process involved applying the vapour barrier and primer VEP 195 with a roller onto the concrete steps behind the lecture theatre. This epoxy primer is particularly well suited to priming the surfaces of subfloors with high residual moisture levels. All of the other surfaces were primed with STAUF D 54, which is a low emission dispersion-based primer. The subfloor in the lecture hall was furthermore finished with the high-strength deep fill and repair mortar STAUF RM in the entrance area in particular, and the levelling compound SPP 95 for evening out height differences. The floor installers had to proceed with particular care in the light-flooded cafeteria, where several columns made it necessary to cut the BauBuche panels to the requisite size. This involved one of the installers preparing the round recesses, while the others took care of bringing in the required materials supplies and extra pallets of BauBuche from the transporter outside the building. The solid wood flooring was subsequently bonded to the subfloor with STAUF SPU 460, which is a single-component, hard, ISO 17178-compliant non-hazardous, solvent and isocyanate-free flooring adhesive. Awarded the highest possible EMICODE® class EC 1 R PLUS, SPU 460 contributes to a pleasant and healthy indoor climate. One of STAUF's SPUs true all-rounders, the SPU 460 is also extremely easy to apply, cures fast and sets quickly. When it comes to adhesives and the like, Werner Hapke has long since made his choice: he has been working with STAUF products for over 60 years and is decidedly happy with his decision, and as the 71-year old laughingly explains: "I find it really difficult when product ranges become too complex. 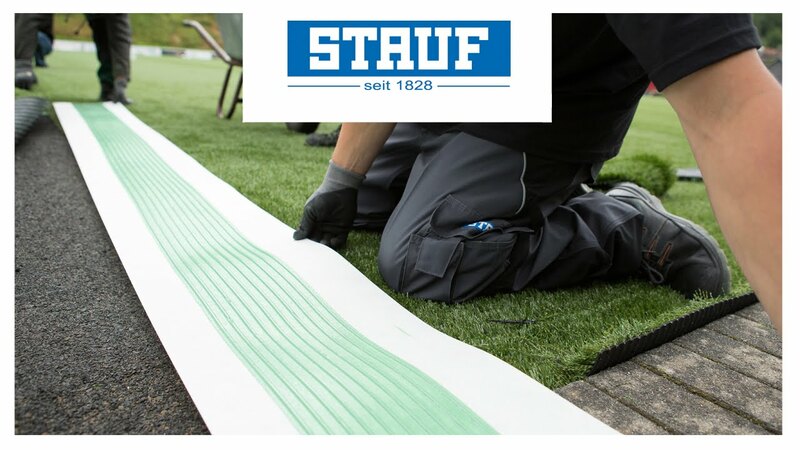 With STAUF, I always know where I'm at – from the primer to the levelling compounds and adhesives. Added to that, I also really appreciate that all of STAUF's staff really know their trade and are always easy to reach". His son Oliver, who is a partner in the company, is also a strong advocate of STAUF's products. As per their latest application, it is also thanks to the individual STAUF products that the solid wooden floor in the new research centre in Bonn is doing its excellent work.